In 1979, Mrs Thatcher was elected Prime Minister of the UK. At the time, the UK was experiencing double-digit inflation, trades unions were powerful and there were signs British industry was becoming increasingly uncompetitive. Deregulation in the financial industry. Reduce power of trade unions. Higher taxes and spending cuts. 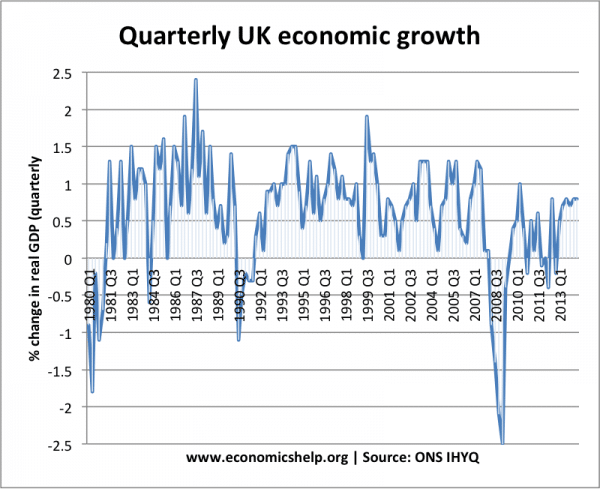 These policies were successful in reducing inflation, but, combined with a strong pound they led to a deep fall in output. 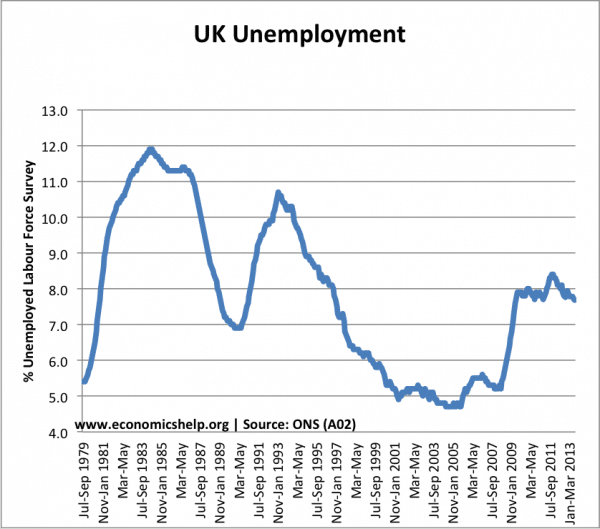 Unemployment rose to three million and there was a very significant decline in manufacturing output. Unemployment remained high throughout the 1980s, suggesting a rise in structural unemployment as a result of the decline in traditional manufacturing firms. Unemployment reached its highest rate since the 1930s. In 1981, 365 economists wrote a letter to the Times arguing the monetarist policies were unnecessarily harming economic output, causing unemployment to be higher than necessary and output lower. In particular, the link between the money supply and inflation was much weaker than predicted by monetarist theory. Despite a deep recession, the money supply grew faster than expected. To meet the money supply targets, required persistent tightening. The link between money supply and inflation proved to be unreliable and by 1984, money supply targets had effectively been dropped. Privatisation of key public sector industries. This includes the privatisation of some of Britain’s biggest companies – BP, BT, British Ga, British Airways. Shares were sold to the general public. The shares were often sold below the market price, and when the companies were floated, share-owners received an immediate increase in wealth. Thatcher claimed she had helped to create a ‘share-owning democracy. Critics argued the government undersold nations resources and oversaw an increase in inequality. De-regulation i.e. allow more competition. Gas, electricity and telecoms were all considered natural monopolies – where the nationalised firm had a legal monopoly. Deregulation meant new firms were allowed to enter the market and use the national infrastructure. Markets like telecoms become quite competitive, and real prices fell sharply. This partly reflects new technology but also can be seen as a successful form of privatisation. Competitive Tendering. This involved opening up council services to the market. Private firms could bid for the right to run public services. The idea was that the private firms would have incentives to be more efficient and do the jobs at a lower cost than the inefficient public services. Critics argued private firms would cut costs to offer inferior service and make a profit at the expense of the local tax-payer. 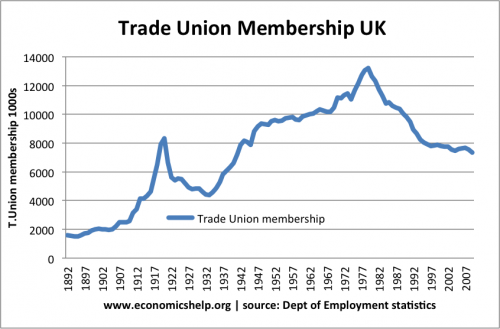 Reduced power of trades unions. The coal miners strike of 1984 was a bitter battle, but Mrs Thatcher was determined to hold out and refuse to give in to the demands of the NUM. After a year-long strike, miners went back to work without receiving demands. This marked an important turning point in industrial relations. The Thatcher government also passed legislation to make it harder to strike – policies such as banning closed shops – banning secondary picketing. Income tax cuts. In 1979, the top rate of income tax was 83%. By 1988, this had been reduced to 40%. The basic rate of income tax was reduced from 33% to 25% in 1988. In 1979, the standard rate of VAT increased from 8% to 15% becoming a more important source of government tax revenue. Poll tax. Most controversially was the introduction of the “Community Charge” called Poll tax which was a new local government tax charging a single rate for everyone regardless of income. 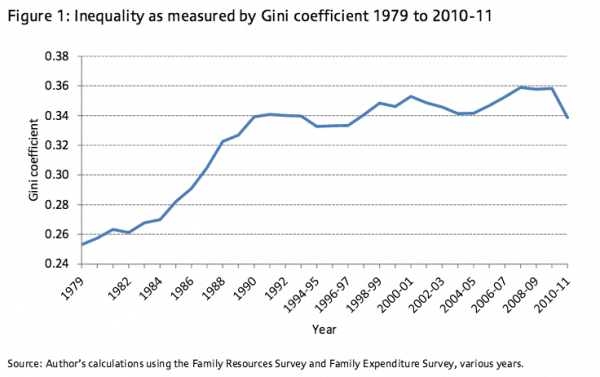 As a result of the more regressive tax system – plus a rise in structural unemployment – there was a marked rise in inequality in the 1980s. Mrs Thatcher sought to encourage home ownership. Mortgage interest relief at source was introduced in the 1983 budget – it gave a tax break to households taking out a mortgage. Due to the new supply-side policies, the Conservatives felt they had presided over an ‘economic miracle’ which meant the economy could now grow faster without inflation. In the late 1980s, Nigel Lawson cut interest rates and taxes and allowed an economic boom. In the late 1980s, house prices rose creating a positive wealth effect. There was also a rise in consumer spending. This led to economic growth of over 5% a year. However, it also caused a rise in inflation to over 10%. 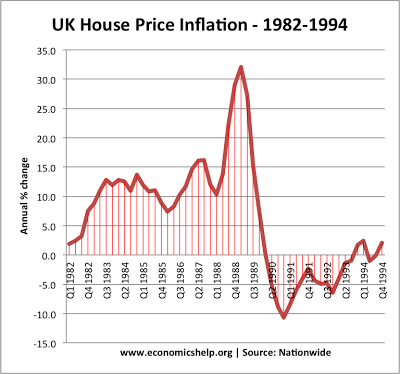 It is a good question – how much was Mrs Thatcher responsible for the Lawson boom and the decision to enter the exchange rate mechanism (ERM) in Oct 1990. Nigel Lawson’s policy of unofficially shadowing the D-Mark was not one of Thatcher’s ideas. This was one reason for monetary policy being too loose in the late 1980s. Thatcher was never keen on the European ERM and only reluctantly agree to join in October 1990 (she was forced from office a month later.